Looking for a heart rate monitor implant. Hello everyone. 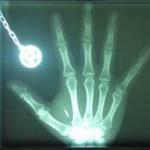 I am very new to the idea of implants and the research I have been doing is interesting but not overly fruitful. Ideally I am looking for an implant that can track my heart rate, oxygen saturation, and blood pressure and can be read by my phone or some other simple devise. If all I can find is heart rate I would be happy with that. I have read a bit about the Circadia and am very interested in it but couldn't find any information about when/if it is going to be released to the public. Does anyone have any information about this or any other implants that might suit me that are currently available or may be available in tbe near future. plenty of choice, some even as convenient breakout boards. Measures heart rate and blood oxygen saturation, no big surprises there. Same chips are used in smart-watches to do the very same job. Not sure how you'd measure blood pressure but that's another thing. Get a ESP8266, a safe battery (maybe an industrial quality 1/3 AAA NiMH) , charging/protection circuit and you'r pretty much good to go. The best part of it, you don't even need to implant it to test it out. To make this an actual implant, there's quite a bit extra work involved. The circuits need to be designed very carefully, especially in terms of failure protection. Same goes for the inductive charging, as hardly any commercial boards I have seen would qualify as safe enough. I would advise against the circadia form factor, also it was never intended to be released to the public in its current state. It's more like a proof of concept than a ready to use product. If you do your job right, the final implant could be about the size of a cigarette lighter. @Damo I love this idea, I'm just not clever enough to be tech-savvy with circuit boards and such.